Like all macros, the Find Duplicate References macro is "dumb"; that is, it only finds identical references. The following image shows references 19 and 78 as submitted for editing. As the image shows, although references 19 and 78 are identical references and are likely to appear identical to an editor, they will not appear identical to the Find Duplicate References macro. Items 1 and 2 show a slight difference in the author name (19: "Infant", 78: "Infantile"). The journal names are different in that in 19 the abbreviated name is used (#3) whereas in 78 the name is spelled out (#4). Finally, as #5 and #6 show, there are a couple of differences in the cite information, namely, the order, the use of a hyphen or en-dash to indicate range, and the final page number. It does not matter what style you apply to the references. What does matter is that you are consistent. 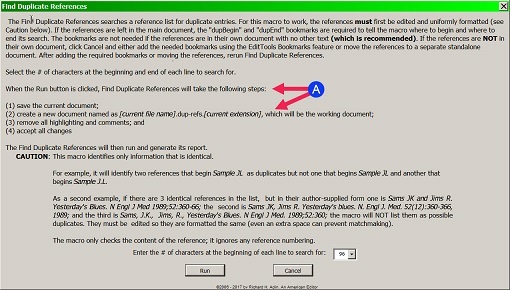 The macro does two passes: one forward (from beginning of reference) and one backward (from end of reference) so as to minimize – but not eliminate – the chance of identical references being missed. Even something as "minor" as an extra space in one reference but not in the other, or different spelling (e.g., American vs British), will cause the macro to miss pairing identical references. So, for example, if one article title uses American spelling and the other uses British (e.g., "immunization" and "immunisation") will result in a missed pairing. This screen provides all of the instructions for running the macro plus it describes how the macro will prepare your file for the Find Duplicate References macro (#A). These steps are important for several reasons. First, you want to be sure that your edited reference list is saved and not disturbed. This is the document you will be sending to your client. Second, to ensure that the original edited version is not disturbed, a work copy of the file needs to be created. 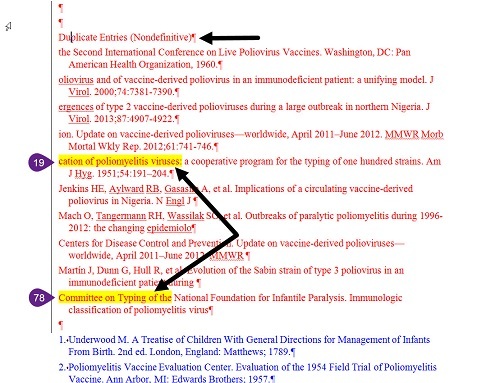 Third, the document needs to be clean, so highlighting is removed. Fourth, and most important, when the macro runs, it needs to "see" only the edited version; anything else could interfere with the matching. Consequently, any queries/comments you inserted are deleted and all of the changes that were made are accepted. Remember that in Word, when changes are made with Tracking on, the material marked as deleted is not yet actually deleted; consequently, when the macro is run, the Tracked items will interfere (as will any comments). 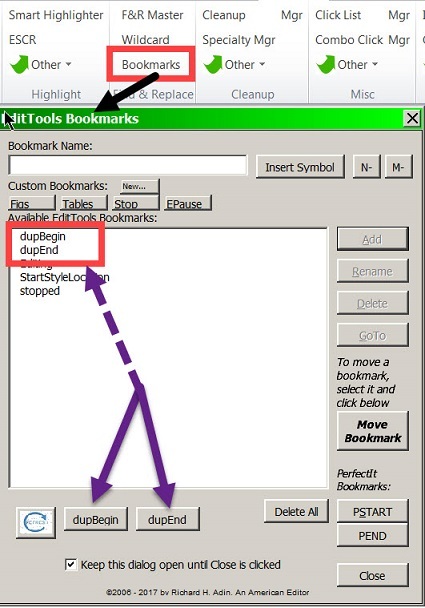 After inserting the bookmarks, reopen the Find Duplicate References dialog. If the references are in a separate file, the macro can be run from the primary dialog, shown here. The Find Duplicate References macro matches a set number of characters, including spaces. 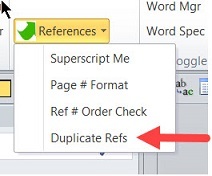 The default is 120 but you can change the number to 36, 48, 60, 72, 84, 96, or 108 using the dropdown arrow shown at #1 in the Find Duplicate References dialog above. Then click Run (#2). (They appear as tracked changes only if the macro is run with Tracking on; if Tracking is off, the results appear as normal text.) Note the title of the duplicates is "Duplicate Entries (Nondefinitive)." The reason for "Nondefinitive" is to remind you that the macro is "dumb" and there is no guarantee that the list includes all duplicates or that all listed items are duplicated. Much of the macro&apos;s accuracy depends on the consistency of editing, including formatting. 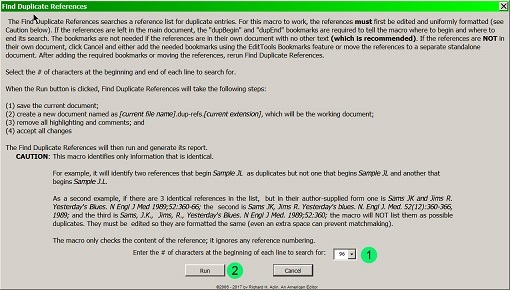 For these examples, the Find Duplicate References macro was run on a list of 735 references and the list of possibilities shown represents those likely duplicate references the macro found. 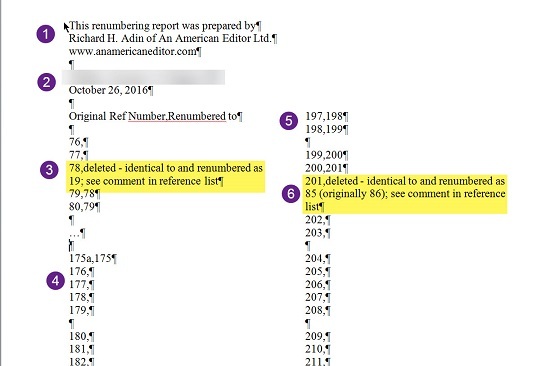 Note that references 19 and 78 were found (#19 and #78 indicate the portions of those references found duplicated by each pass of the macro); however, if, for example, in editing the page range separator in #19 was left as an en-dash in reference 19 and as a hyphen in reference 78, the macro would not have listed the material at #19 as there would not have been a match, but it would have listed #78. Similarly, if the author name in reference 19 had been left as "Infant" and in reference 78 as "Infantile", the macro would not have listed the material at #78 as there would not have been a match; however, it would have listed #19–thus the reason for the two passes. When a duplicate is found, you can insert a prewritten, standardized comment (using EditTools&apos; Insert Query) to tell the client that references x and y are duplicates and that one is being deleted and renumbered (see image below for a sample comment). Insert the comment at each of the duplicate references, slightly modifying the comment so that it is appropriate for the reference to which it is being attached. The comment shown below is inserted at reference 78 and its language is appropriate for that reference. It tells the client that references 19 and 78 are identical and that reference 78 has been deleted and renumbered as 19. This type of comment is added to the version (e.g., the Track Changes version) of the reference list that will be given the client. The comment is added to the appropriate references as duplication is confirmed. Every report bears the creator&apos;s identification information (#1) and file title (#2). You set the creator information once and it remains the same for every report until you change it using a manager. The file title is set each time you create a report.